We are happy to announce Give A Day RVA – Youth Edition launches this Spring and we need your help! HandsOn Greater Richmond and Read to Them have teamed up for the 2019 One Richmond One Book (OROB) Event! Imagine all 26 elementary schools excited about reading the same book together at the same time! Imagine community members, civic organizations, local businesses, and the entire community joining in! One Richmond, One Book will be an inclusive city-wide reading event, allowing all elementary students to participate. All 26 elementary schools within the Richmond Public School system will be sponsored and receive program materials, activities, and complimentary books for every child. 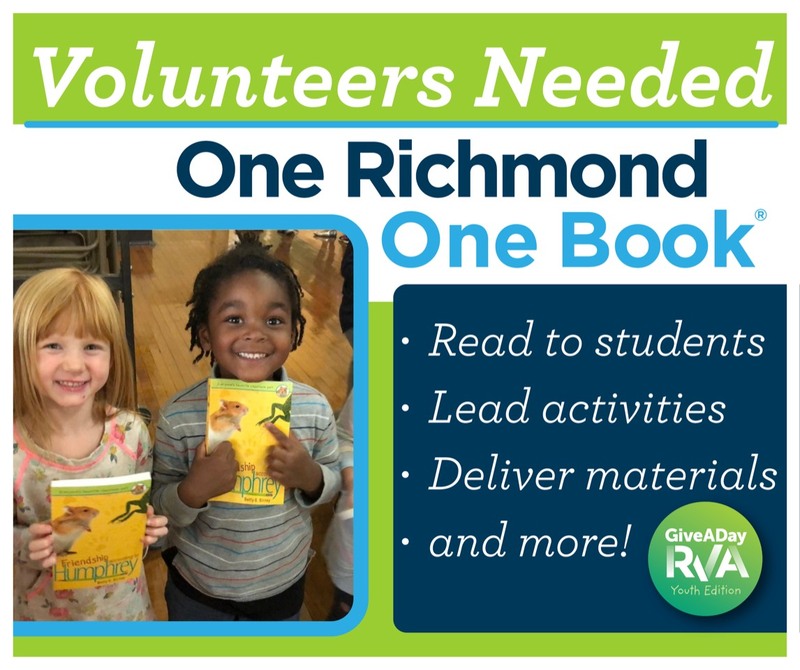 One Richmond, One Book will include a bevy of supportive, supplemental program initiatives including in-school assembly skits, arts and craft projects, after-school reading programs, sponsored family literacy nights, and other fun and engaging activities. One Richmond, One Book will deliver fun, educational, and engaging literacy-based activities for all the children of Richmond. Over 100% increase in school participation- from 10 to 23 schools! Currently, have over 100 volunteer opportunities and many more coming in today!